Kubota Tractor Australia 's range of petrol and diesel zero turn mowers have proved to be a popular choice with customers looking to reduce mowing time. The market for zero turn mowers in Australia has been steadily increasing as operators take advantage of the improvements in productivity over that of conventional out front and ride on mowers. Kubota Tractor Australia offer a choice of six zero turn models including three petrol models (22 horsepower ZG222, 27 horsepower ZG227, 27 horsepower ZG327) and three diesel models (26 horsepower ZD326, two 31 horsepower). All Kubota Tractor Australia zero turn mowers feature Kubota engines which have long been recognized for state of the art energy efficient performance. Kubota Tractor Australia petrol engines, developed especially for zero turn mowers, deliver power and reliability with maximum efficiency. They satisfy the essential elements of low noise, ease of maintenance and low fuel consumption. In order to extend maintenance intervals, the structure of these clean-flow petrol engines significantly reduces the possibility of the cooling air passage becoming clogged with grass clippings. Diesel powered zero turn mowers feature engines incorporating Kubota Tractor Australia's environmentally friendly three vortex combustion system (E-TVCS) that meets all emission requirements. Kubota Tractor Australia also offer something different in the transmission of their zero turn mowers. Incorporating integral design not only for the hydrostatic transmission (HST) itself but also for every part leading in and out of this transmission system, enhances performance and provides durability. Unlike other zero turn mowers Kubota Tractor Australia zero turn mowers have a direct shaft drive from the engine to the transmission and from the transmission PTO to the mower deck. Durability is significantly improved as there is no need to make the adjustments or replacements associated with conventional belt drives. Further to this, long life oil immersed multi disc brakes and PTO clutch have been fitted for for improved durability and reliability. For operator comfortability and convenience, these zero turn mowers feature a spacious operating platform with all controls within easy reach. Large easy to grip operating levers are fitted and a foot operated hydraulic deck lift eliminates the need for the operator to take their hands off the operating levers to raise or lower the mower deck. 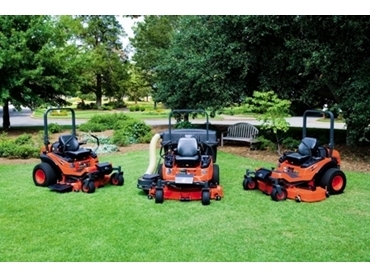 Kubota Pro-commercial mower decks are fitted as standard to these zero turn mowers. They offer cutting width from 48” to 72 “ and are of a 6” or 6.5” deep deck structure. Kubota zero turn mowers are only a part of a large range of mowing equipment available from Kubota Tractors Australia.